• Over 50 fonts in all! This is the Homepage of the official Graffiti Fonts™ Collection. 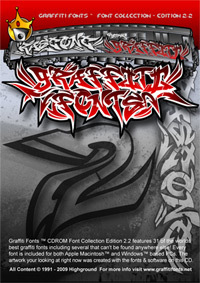 Featuring over 350 authentic graffiti style fonts, the largest collection of graffiti style lettering & fonts on earth. Graffiti Fonts® digital typefaces work on any Mac, PC or Linux computer & are fully compatible with industry standard design software such as Adobe Photoshop, Illustrator, Corel Draw, Cinema 4D, Flash etc. From learning to draw your name in graffiti, to commercial graphic design & web work, or even integration into mobile & web apps, our Graffiti Fonts are a rich source of material. This website is dedicated entirely to the Graffiti Fonts� Collection and features all of the worlds earliest graffiti style typefaces. Founded in 1999 the official Graffiti Fonts™ collection includes most of the worlds top graff inspired typefaces, all made by real writers with years of experience in the art of graffiti lettering. Our collection features many fonts that are not available anywhere else and includes over 100 exclusive styles as well as advanced versions and additional formats of all the classics. Working with other developers we have collected virtually every graffiti font in the world. We have maintained and updated this collection since the late 90's. Our foundry has been lucky enough to provide custom graffiti lettering & typefaces for apps, games, websites, print design, movies, clothing and more across a multitude of industries. We continue to work every day to bring you the best material we can. All of Highground's Graffiti Font CDROMs & DVD ROMs now include high quality, open source graphic design, web development, animation, image processing & illustration & office software. This free software works similar to leading high-end applications, like Adobe Illustrator, Photoshop, Flash, Microsoft Office & others. This collection of reliable applications provides a complete development environment without having to spend a dime. 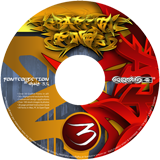 The new 3.2CD includes over 50 of the worlds top graffiti style fonts for both Apple™ and Windows™ users as well as over 120 Hip-Hop themed stock images & Illustrations, clip-art, templates & more. 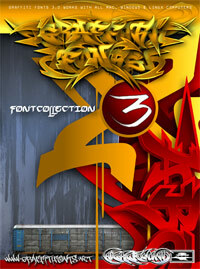 31 Exclusive fonts in all with 17 all new exclusive graffiti fonts and new styles from tags to burners. We have also included a fat package of advanced design software for FREE! The edition 2.1 CDROM features 31 fonts, including 11 new exclusive fonts, only available from Highground. 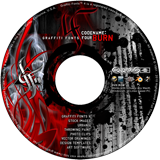 Our first CDROM features 13 of the worlds top Graffiti Fonts for Mac, PC and Linux users. 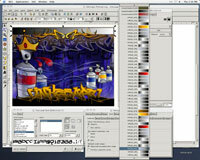 WildStyle™ Graffiti Font shown here at work in Inkcape. 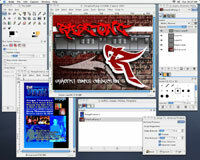 RaseOne™ Graffiti Font shown here in the open source GIMP app. Online Graffiti Creator by Full Time Artists. On GraffWriter.com you can create an unlimited number of custom graffiti style banners, logos & other artwork for free. Download your image to use it for printed materials or host it with us for free & post it to your social network pages or other online space. 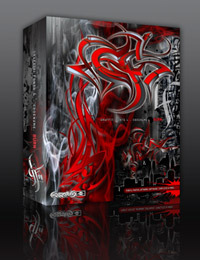 Graffiti Fonts® CDROM & DVDROM typeface & artwork collections - 4 levels to fit your needs & budget. Graffiti Fonts® is a registered trademark of Highground Industries. All Typefaces and artwork are the property of Highground Industries & Full Time Artists © 1991 - 2018 unless otherwise noted. Unauthorized duplication is prohibited. All materials on this site are wholely owned by thier creators and may not be redistributed in any way without advance written consent.